Our work has two major lines of interest, the preservation of a threatened species, the sturgeon, and how bacterial communities assemble. The link between these two topics is of broad interest to aquatic ecology. The sturgeon is either threatened or endangered in many of its natural habitats. There are several contributing factors including overfishing and habitat degradation. In this study, we were focusing on the exceptionally high mortality of the egg, some of which is caused by microbial activity. To better understand this mortality, we had previously examined, using cultivation-independent techniques, the microbial community associated with the egg over time, and how the phylogenetic composition of the microbial community can determine egg mortality. In the wild or in a hatchery setting, the extruded eggs of fish and amphibia (eg. frogs) are essentially sterile but enter an aquatic environment with bacteria at 105-107 cells/ml. Within 15 minutes eggs are rapidly colonized by a diverse collection of microbes and the phylogenetic composition of this new attached community can change over time. The accompanying image shows the surface of a sturgeon egg at 5000x magnification and the morphologically diverse collection of microbes that are attached. To further our understanding of this dynamic community, we isolated and characterized several hundred bacterial strains from the surface of the sturgeon egg. After identification of strains with comparative 16S rRNA phylogeny, we tested the ability of each strain to form a biofilm, a measure of its ability to attach to a surface, such as the egg. We also measured the antagonism between strains with a simple agar overlay technique that detects antimicrobial activity produced by strains. This test revealed 8 strains that produced antimicrobial activity targeting other isolates in our study. One strain, in particular, a Pseudomonas sp., produced an antimicrobial compound(s) that was effective against 60% of the isolates and five of six known fish pathogens. The identification of a native bacterial species not known to be a fish pathogen, that produces antimicrobials targeting fish pathogens, is an excellent description of a potential probiotic, a strain that could attach to the egg and prevent pathogens from developing critical mass. Our logic is that a more detailed understanding of the egg-associated microbial community could lead to a probiotic approach that reduces egg mortality (at least in the hatchery) and provides better management practices by reducing dependence on environmentally unfriendly chemicals (eg. disinfectants). Our second line of interest was to gain a better understanding of how bacterial communities assemble. As mentioned above, the sturgeon egg with its proteoglycan outer coat is essentially sterile when it enters the water column. This provides an excellent model for the assembly of microbial communities as one can easily investigate how the community develops by removing eggs at various time points and determining the phylogenetic composition of the microbial community. We now know that not every microbial population in the water can adhere to eggs and that there are pioneer colonizers that attach within the first 1-3 hours followed by secondary invaders that reorganize the community by 24 hours. Some of our isolates are early colonizers. We also know that some known fish pathogens like Aeromonas can aggressively colonize the egg in the wild. In addition, the egg model can determine how specific bacterial populations alter the development of the community by spiking the fertilization process in the hatchery with a single bacterial strain. For example, we have shown that by intervening early in the colonization of eggs in this manner, we can reduce the level of egg mortality. 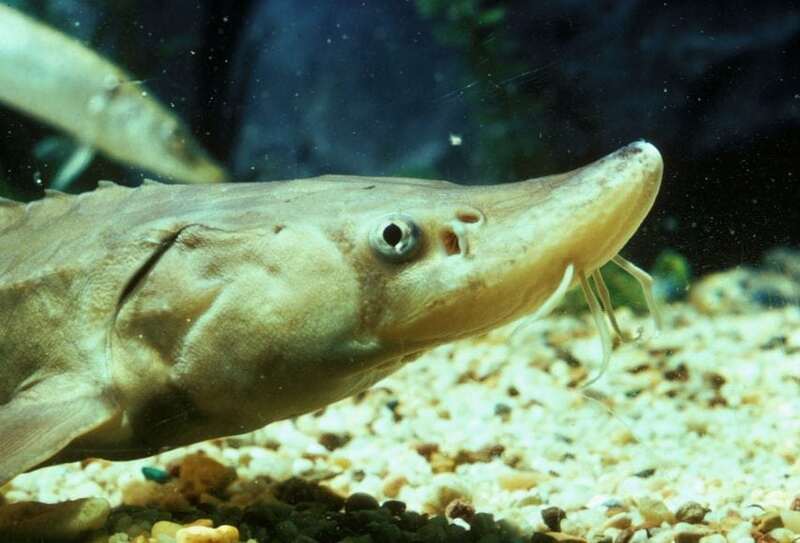 It should be clear that if we can manipulate the microbial community on the egg towards a less pathogenic structure, then we have a better chance of preserving aquatic species like the sturgeon. On a larger ecological scale, aquatic animals have evolved for millions of years and their evolutionary prosperity demonstrates that they have successfully negotiated with the microbial world of “natural” aquatic systems. However, dramatic shifts in the aquatic microbial community caused by climate change or more direct anthropogenic activities (contaminants) could radically alter the survival of aquatic animals by shifting this negotiated balance. We need to better understand these essential linkages so that we can preserve the biodiversity of aquatic systems. These findings are described in the article entitled Antagonistic Interactions and Biofilm Forming Capabilities Among Bacterial Strains Isolated from the Egg Surfaces of Lake Sturgeon (Acipenser fulvescens), published in the journal Microbial Ecology. This work was led by Terence L. Marsh from Michigan State University. Terrence L. Marsh is an associate professor at Michigan State University in the Department of Microbiology and Molecular Genetics. His laboratory has focused on the structure of microbial communities in a variety of habitats including soils and contaminated sediments, fish eggs, pig tonsils, human gut and vaginal tract, and anaerobic bioreactors.